CarWizard.net is an integrated and complete auto dealer websites platform and a single-source Internet inventory management system. Our best-in-industry automotive dealer websites come with an impressive set of tools required to market the vehicles and generate leads. The car dealer websites are completely customizable and support an unlimited number of vehicles as well as large amount of content. The integrated dealer websites platform features a reliable VIN decoder, powerful Craigslist/EBay Motors posting tools, daily inventory imports/exports, responsive mobile website, true SSL secure website, window stickers/buyers guide printing, a complete set of online forms sent to you directly via email, secure finance application, and much more. Take and upload pictures, manage your cars and website. Trial Dealer Website - In 5 Minutes! CarWizard.net can feed your inventory to any third party. 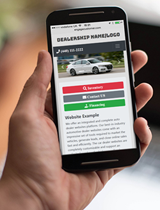 In most cases, your customers will first discover your vehicles and review the specifications and photos on third-party automotive classified websites before visiting your online dealership. Websites like AutoTrader.com, Cars.com, CarGurus.com, KBB.com, Carfax.com, etc. are among largest automotive classifieds in the U.S. Thousands of people search their online inventories daily. Most major paid classified websites accept automatic inventory feeds from approved third-party data providers. We can feed your inventory daily into your own AutoTrader.com, Cars.com, CarGurus.com, etc. accounts. After setup, the inventory feeds will be automatic. There is nothing you need to do; we will take care of everything for you. This is a FREE service for our customers and comes standard with all our car dealer websites. AutoTrader.com and Cars.com will also feed your inventory to other major automotive classified websites such Kelly Blue Book, MSN Autos, etc. greatly increasing the chance of generating more leads. Most Dealer Management Software (DMS) packages offer FTP uploads to third parties. The DMS transmits the inventory feed including data and pictures. There is nothing else you need to do on your end. We receive and process your inventory feed and your cars will automatically appear on your car dealer website. Partners are welcomed. If you are a DMS development company and would like to integrate with us to offer your customers a complete package (DMS plus car dealer website), we would be happy to work with you. Please contact us to discuss the details. The car dealer websites cost $24.95 per month. We accept all major credit cards and PayPal. You can pay on a month-to-month basis or prepay for a number of months in advance - it is your choice. We require no long-term commitment. You can cancel at any time, and we will refund any unused money - no questions asked.